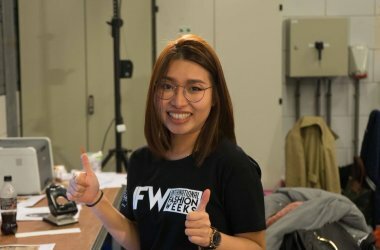 Several students and alumni of Wittenborg University of Applied Sciences were involved in the recently held International Fashion Week in Amsterdam (IFWA). Vietnamese graduate, Trang Ta, who completed her EuroBA degree a mere 4 months ago, served as executive assistant for the shows which took place in the World Fashion Centre last weekend. Designers came from France, Italy, South Africa, Morocco, Canada, the US, the UK, Turkey, and of course, the Netherlands. A couple of Wittenborg students also volunteered for the event. Indonesian student, Bertha Tanaem, took part in the IFWA by exhibiting handmade items sold by her new company Ayotupas. The products are made by local craftspeople throughout the Indonesia Archipelago. They range from handwoven fabric - that takes 3 months to make - to finished products such as woven-leather bags made by traditional leather workers in Bali and Java. “AYOTUPAS’ journey started back in February 2018 when I visited Timor with my partner and my father. We travelled from village to village, and I had the privilege to meet many Timorese weavers who shared their stories about the meaning of each motif. They differ from village to village and from tribe to tribe,” Tanaem wrote on Facebook about how the company came about.